Everybody sing: "There's a zombie on your Android-powered smartphone~!" 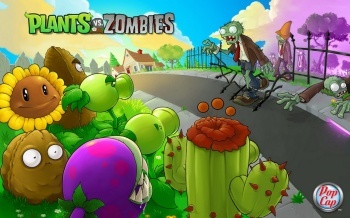 PopCap's Plants vs. Zombies is pretty much our favorite casual game ever, so we here at The Escapist were pretty darn pleased to hear that it would be coming to Android free (for a day) sometime in May. Well, that sometime is today. For those of you with phones or tablets running Google's Android OS, head on over to the Amazon Appstore to pick up PopCap's excellent undead-themed tower defense game for the low price of absolutely free. Once the day-one amnesty period is over, though, you'll have to pay $2.99 for it - hardly breaking the bank, especially for a game this good, but it's not free, eh? Wait, Motorola Droid? I have a Motorola Droid! This video is suddenly very appropriate. One moment, everyone, I'm going to go sob into my hands for a bit.